CHALLENGE: Position AFRH as the premier retirement home exclusively for US veterans. Also motivate veterans to apply for residency. 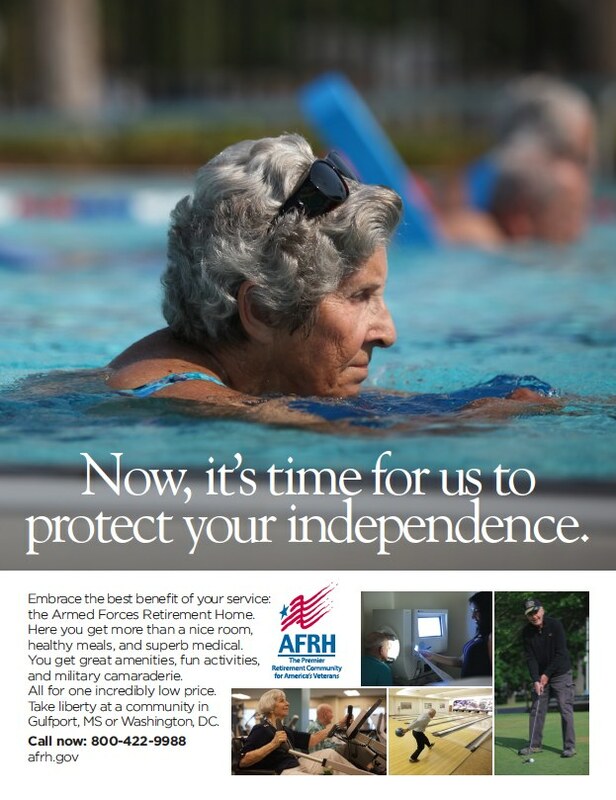 SOLUTION: Create print ads in veterans’ magazines where each ad demonstrates a major lifestyle benefit of living at AFRH. Our headlines use military jargon that is familiar to our audience. We shot original photos of real residents doing the most popular activities. Plus we designed the type a little larger for older eyes. RESULTS: We created broader awareness of AFRH and the Agency had a noteworthy increase in resident inquiries. Moreover we got plenty of buzz among veterans at VFW and American Legion meetings because our featured residents became local celebrities. EXECUTION: “Independence” features a Navy veteran Gerry enjoying her daily swim in the new outdoor pool at AFRH-Gulfport.